Grand Traverse Bay is most known for it's great smallmouth bass fishing. The Bay is ranked in the top 10 places in the United States to fish for smallies. If the smallmouth fishing is top 10, then the Carp fishing is #1. 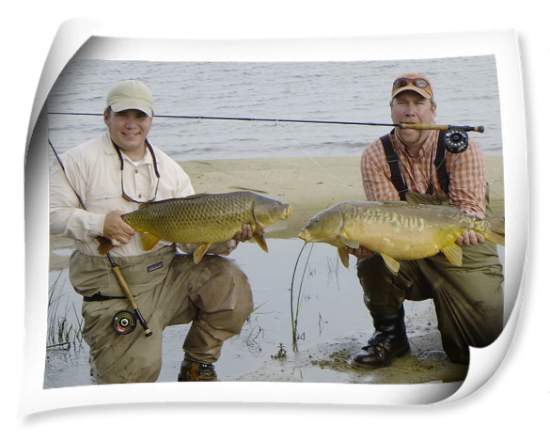 Grand Traverse Bay and the Traverse city area located in Michgan provide some of the best carp fishing on a fly in the World! Thousands of carp enter the shallow flats of Grand Traverse Bays (East Bay / West Bay) to feed, sun, and spawn during the early months of summer. Golden bones are what carp have been nicknamed by those looking to try and fool this smart and shy fish. Carp feed very much like redfish on in the south, working shallow water looking for food in the grasses and sand flats. Carp have poor sight and a well placed fly is key to getting these fish to take a fly! Late may and early June is when the carp fishing starts to take off, with the middle of June being peak time to chase carp on the flats. Carp will use many of flats that giant smallmouth bass use to spawn in June providing great opportunities at both species. Small crayfish patterns, leech patterns, and various nymph patterns are used to fool these smart fish. 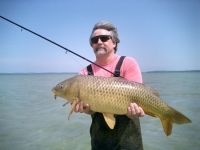 Carp in the Grand Traverse Bay area average in the 13 -18 lb range with some fish pushing the upper 20 lb range. Fighting a fish that can take backing at will , leaves many anglers looking forward to the next flat. Using techniques adopted from the salt, anglers stalk and cast to these giants from a boat or wading. The use of a clear tip fly line can help in not spooking carp, and allow an angler several cast at the same group of fish. The carp is an understood fish, not considered a game fish or good table fair, but considered by most as a garbadge fish. The carp season on Grand Traverse Bay can be productive for most of the summer, but the best opportunities are in June and early July. A guide can help locate carp, as well as relocate anglers when a flat has been worked well. A good guide can provide hundreds of areas that can produce carp on a fly.